To Undo Things Done. A Woman Killed With Kindness. National Theatre, London. September 10th. Some afternoons are grey, misty, cold and dingy and as such require bolting oneself away into a warm, dark corner with tea and comfort. It was one of those afternoons along the South Bank as I headed to the National Theatre to see Heywood’s Jacobean Domestic Drama A Woman Killed With Kindness. Written in 1603, Heywood’s drama explores two female protagonists, both -in their own way –trapped within their own version of domesticity. 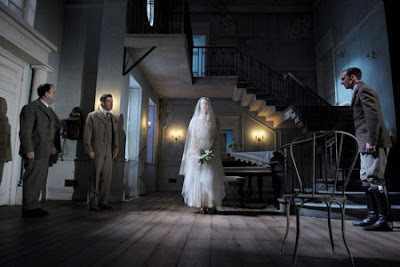 Directed by current British wunderkind Katie Mitchell, the play was reset into Edwardian middle class England. 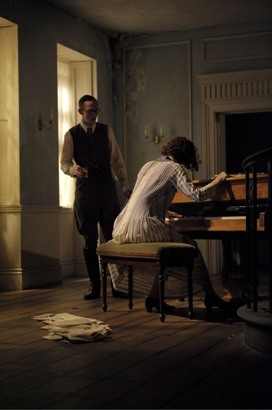 The stage was split into two halves, on each side the action of one woman being echoed by the other – even both trilling plaintive chords on the piano together as their stores interweave. Now being a good hefty slice of Jacobean Drama this was not a happy families scenario, although it at first appeared so in one case. We began with the gilded wedding of Anne (Liz White) to John Frankfurt (Paul Ready ), a smugly, gloriously happy middle class pairing. Not so happy at the wedding is the increasingly drunken Sir Charles Mountford (Leo Bill) – who had clearly been in love with Anne himself. Meanwhile on the opposite side of the stage in a darkened house sits Charles’ put-upon sister, Susan Mountford (Sandy McDade), quiet, solitary and alone. It was a haunting opening image. Further drama ensues as Anne’s infidelity is shockingly exposed and Susan is married to a man she detests in order for her brother to discharge a debt of honour. Anne is punished with a ‘kind’ act and sent to a neighbouring estate with her belongings, but barred from ever returning home, seeing her husband or her children again. It is this ‘kind’ act that leads to her death, as overcome with guilt she refuses to eat. Susan, speaking out finally, makes a final chilling declamation, that Anne was a ‘woman killed with kindness’. A powerful story then and Mitchells’ direction showed the ways in which both women were simply pawns in the power struggles and web of control of the variety of men that surrounded them. 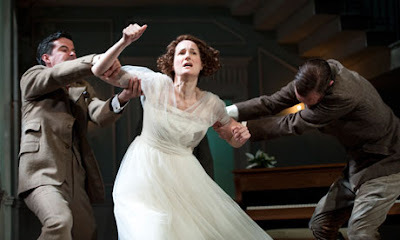 This was perhaps most graphically shown when Susan, dressed in bridal gown and veil, attempted to flee the house before her ill fated wedding, and was grabbed and held back two or three times before emitting a banshee wail of grief and rage. After this sudden outburst she returns to the still doll-like frozen posture; not quite defeated but knowing her fight will never win. Hers was a masterful performance, showing adroitly the ennui, the frustrations and the difficulties of her situation. Of course for its time a domestic tragedy was quite groundbreaking, let alone having an unfaithful wife as a potential heroine. Mitchell’s direction allowed us to feel the full force of this impact. Masterfully done this was a powerful and compelling piece of stage work with bravura acting from the two lead women and making the Jacobean contemporary.